Every time you buy an email list a puppy dies. – Some purchased lists include harvested email addresses, which is illegal. – You’ll get little to no recipient engagement; therefore, your deliverability will decrease. – You are greatly increasing your chance of being blacklisted as well as put on URL block lists. – You can harm your email service provider’s (ESP) IP reputation, which can result in your ESP “firing” you as a client (and it can be difficult to get another ESP to commit to working with you). – Your general business reputation will be at stake as you will be seen as a spammer. – A puppy will die. As you can see, buying an email list can harm your business and also have a negative effect on others. In order to run a successful email marketing program, it’s important to build an organic list of subscribers who have asked to hear from you. In other words, they have actively opted-in to your list. Growing your email list can take time, but it will be worth it in the end. You will be communicating with engaged recipients who want to receive your messages, and your open rates, click-through rates, and conversion rates will climb as a result. There are many ways to organically grow your email list, and as with everything else in email marketing, not all methods will work for everyone. It’s up to you to test and try out different tactics to find out what works best for your program. 1. Facebook, Twitter & LinkedIn. 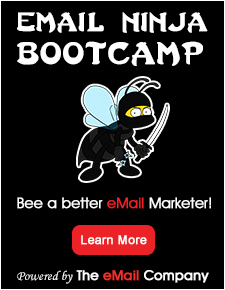 Promote your email marketing program through social media. Announce via a wall post or tweet that your newsletter is coming out shortly, and include a link so your fans and followers can sign up. (Bonus: add an opt-in form directly on your Facebook page. Get step-by-step instructions now.) Include Share with Your Network (SWYN) in your emails, so subscribers can share your messages with their social networks. Potential recipients will get a taste of your newsletter and will want to sign up to receive future issues. Include an email subscription center on your blog, and make sure it’s a prominent call-to-action that’s available in the content of your posts as well as in site navigation. Also, republish email content on your blog, and be sure to include a link to sign up for future emails. Don’t limit yourself to your blog only. Guest-write for other blogs and publications, including a link to your website and newsletter subscription as part of your bio and in all articles. 3. Include a link to your email subscription center on employees’ business cards and in their email signatures. 4. Promote on your website. Include an opt-in form on the top 10 pages of your website as determined by your web analytics. Don’t forget your homepage! Make the opt-in form stand out, and provide a clear call-to-action. 5. Search optimize your newsletter page. Optimize your email subscription center for keywords related to your area of expertise and email, such as “travel agent newsletter” or “entrepreneur newsletter”. Let the search engines do the work for you and drive new potential subscribers to the page where they can sign up to be on your email list. 6. Include testimonials on your email subscription page. Ask existing, engaged subscribers to write a short testimonial or film a video talking about how valuable your emails are. If prospects know that others find your emails valuable, they are more likely to sign up to receive your emails. 7. Ask while on the phone. Your salespeople, client service representatives, and Support team are on the phone all day. Encourage them to ask clients and prospects if they want to be added to your email list and direct them to your subscription center to sign up. Talk about your email subscription center while networking or speaking at events. Ask while exhibiting at tradeshows, but don’t forget that a business card in a fishbowl is not necessarily permission to add someone to your email list. I recommend sending a follow up email thanking them for stopping by, and then direct them to your subscription center. Use a mobile application to collect email addresses. If you’re at a tradeshow, conference, or meeting, use an iPhone app (or other platform application) to add new subscribers on the fly, rather than waiting to do data import later. Be sure, of course, that a privacy notice is displayed prominently and clearly. Want 41 more tips for growing your email marketing list? 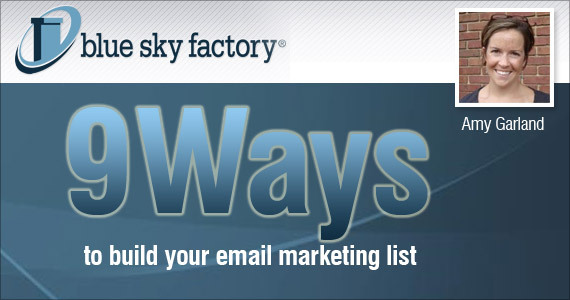 Download Blue Sky Factory’s free eBook, “50 Ways to Grow Your Email Marketing List”. In the meantime, protect the puppies. Don’t buy email lists! Takeaway: The possibilities are endless when it comes to growing your email list; it can just take time and effort. Purchasing may seem like a quick fix, but will cause you more harm in the end.